Godzilla movie sequel news: Well, if you were wondering, enough folks were waiting in the wings for Godzilla to open, that it's broached the $100M box office mark internationally, including the $93M domestic box office opening weekend. Of course it's nice to see Godzilla get a decent screen story and be taken seriously enough to have a great marketing plan in place to help promote it's theater opening week. As the weekend progressed fan groups were surmising what will be in the next movie, the sequel. This, before there were too many numbers in. But initial impressions, ala, Thursday night, Friday numbers were looking good. I'm sure that Legendary was already toying with the idea of a sequel, but playing it safe, they waited until opening weekend numbers came in, to see if there's a market for a sequel. And with the numbers screaming at them, Deadline reports that Legendary announced the they're "developing" a sequel to the film. Developing is a fascinating term. It could mean anything from idea storyboarding to writing a script to what ever else could be considered developing. Now how this latest Godzilla movie played out in the story might have upset some fans, while others loved it. Meaning that like in Gareth Edwards indie film, Monsters, he focused more on story rather than focusing on the desctruction that the monsters created. So too in Godzilla, the monsters were part of the story focus, but not the center-piece of the story that developed on the screen, but rather, we followed the characters as they dealt with the monsters. Edwards has said, in regards to a sequel, that he would use the same story-telling restraint. This restraint, as he put it, is something he learned from watching Spielberg movies, where the monster reveals came later on in the movie. Now whether he will be connected to the sequel or not is another matter. Many studios tend to swap out directors as a franchise goes through sequels, but in my opinion, that's more a money issue than anything, as studios look to control costs in their productions. 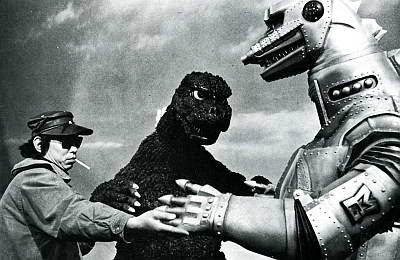 But the other thing that everyone is asking or surmising, is who will be the next monster that Godzilla will face off with? Some have suggested Mothra. Others have suggested other Toho licensed monsters. If I am not mistaken and did not miss the news at some point during the development of the first film, Legendary only bought the rights to Godzilla. So unless Legendary gets additional rights, or there's more to the rights that they have now, we'll be seeing another new kind of enemy/enemies of Godzilla the next time around, if there is one. I say if there is one, because we still have to see what kind of momentum or drop off the box office numbers carry forth. The journey for most folks for this movie, was about four years of announcements and developments and filming reports. I'm resetting the clock to zero and here we go again. Hopefully.